A star some 5,000 light years from Earth has been hailed the roundest object in nature by a team of astrophysicists.The sun was previously believed to be the most perfectly round natural object in the universe. Researchers at the Max Planck Institute for Solar System Research and the University of Göttingen, Germany measured the roundness of the star ‘Kepler 11145123’. Although the celestial body is not a perfect sphere, the team found that the difference between its equatorial length and its polar axis is smaller than that of the sun, meaning it is more round in shape. Previously, comparisons of the sun’s diameter at its equator and at its poles noted a 10km difference, making it the record holder for the most perfect natural sphere. However, the sun’s new contender for the ‘roundest’ claim has a deviation of only 3km in its measurements. 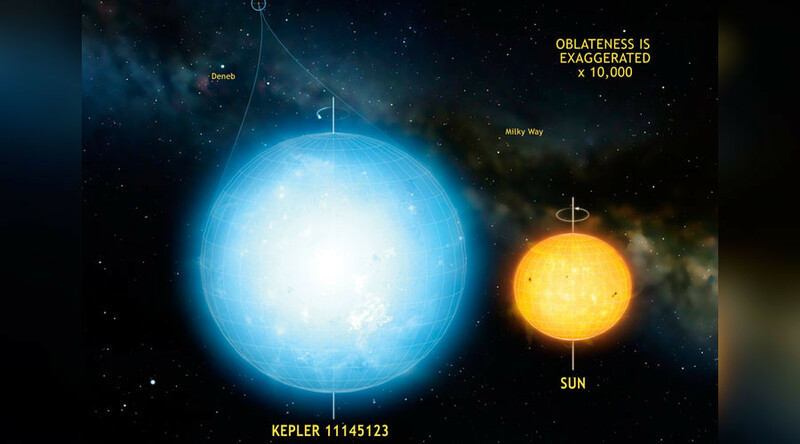 The small margin is especially surprising given that the average radius of the giant star is a colossal 1.5 million km, according to a statement from the researchers. Laurent Gizon, the study’s lead researcher, confirmed that Kepler 11145123 is now “the most rounded object ever observed in nature, rounder than the sun.” The team said the measurement was made with an accuracy of 1km. The star, which is twice the size of the sun and takes three times as long to complete one revolution around its own axis, was chosen for the study because it shows ’sinusoidal vibrations’. NASA’s Kepler telescope has observed these vibrations for four years. Stars and planets are not perfect spheres and are flattened out to some degree as they rotate about their axis due to centrifugal force. The team had expected this star to be more flattened and now hope to assess other stars using ‘asteroseismology’, which allows researchers to study the magnetic properties of distant stars. "We plan to use the method in other stars – those that the Kepler space telescope currently has in view, and those who will observe the planned space observatories PLATO and TESS," said Gizon.